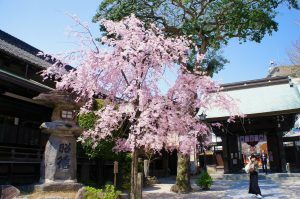 Fukuoka blooms on March 21 and full bloom is expected on March 29 of today! It will warm up at a stretch, and the temperature is expected to rise to 20 ° C today. 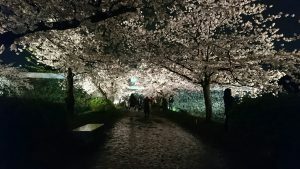 Then, we introduce the Hanami spot recommended by WeBase Hakata staff. First of all, we will introduce you to the magnificent Someiyoshino , which is a 5-minute walk away! It cherry blooms so beautiful, there are many people who take selfies under the cherry blossom trees. Tenjin area can be reached in about 10 minutes on foot. 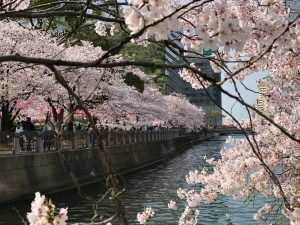 Tenjin Chuo Park is lined with a lot of cherry trees along the Nakagawa River, and it is very beautiful when it is in full bloom. 3 stations by subway from WeBase Hakata. The contrast between the castle wall and the cherry blossoms is very nice. 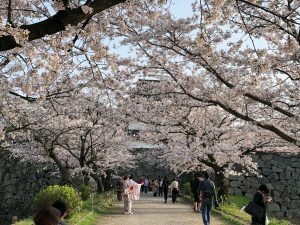 There are many people at the cherry blossoms season. also night light up is also fantastic and wonderful!